Does a Hot Summer Mean a Very Cold Winter? Is Your Furnace Ready? You are here: Home / HVAC Info & Articles / Articles / Does a Hot Summer Mean a Very Cold Winter? Does a Hot Summer Mean a Very Cold Winter? This summer has been a real scorcher. We’ve had temperatures in the upper 90s, not much rain, burned out grass, and even leaves falling from trees prematurely. But does a hot summer mean we’re in for a bitterly cold winter? You could say it’s one of those “old wives’ tales” that a hot summer proceeds a colder winter, but is there any actual science behind the theory? And what does that mean for HVAC companies performing heating repair in Greensboro, NC, in the upcoming season? Meteorologists have done extensive studies to test this theory, and have found that summer weather is in no way a predictor of winter weather. A hot summer could be followed up by a milder winter just as readily as a colder winter. Really, the only predictable aspect of weather is its unpredictability. The experts study the trends and attempt to predict the weather as accurately as possible, but as you’ve probably experienced on many occasion, they are not always right. Since we’ve determined that we can’t predict the weather for the upcoming winter, it’s best to be prepared for anything. Is your furnace ready to handle a cold winter? Do you have enough propane or heating oil to last you through the season? If you’re not sure of your answer to either of those questions, you need to call Berico right away. Heating repair in Greensboro, NC, is best taken care of before the start of cold weather. 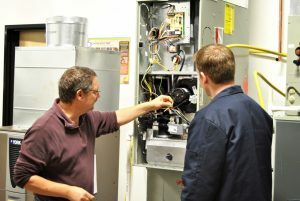 Once the first chilly night hits and everyone starts turning their furnaces on, you may be one of many who find out that their furnace was not ready for winter. When that happens, your HVAC (heating, ventilation, and air conditioning) company will be busy responding to all the calls that come in and you may find yourself waiting in the cold for a technician to come out and repair your furnace. The first touch of cold weather is also an unfortunate time to find out your propane or oil tank is empty. Not only will you have to wait for a refill, but you will be stuck paying whatever the current price is for heating fuel. And if your propane tank is completely emptied it is at risk for damage. Leaks can occur during refill and air and moisture can seep into the tank which may cause the inside of the tank to rust. If your oil tank runs dry it can cause damage to your furnace, such as failure to start up again once the oil is replenished. We may not know if this winter will be frigid or mild, but making sure your heating system is ready well in advance is always best. Find out how you can be prepared for any weather and save money at the same time with a Comfort and Protection Service Agreement from Berico. A furnace tune-up and fuel discount is the winning combination. Call (336) 273-8663.
https://www.berico.com/wp-content/uploads/2018/12/header-logo-new-3a.png 0 0 Preston Howard https://www.berico.com/wp-content/uploads/2018/12/header-logo-new-3a.png Preston Howard2017-09-23 18:54:302017-09-23 18:54:30Does a Hot Summer Mean a Very Cold Winter?